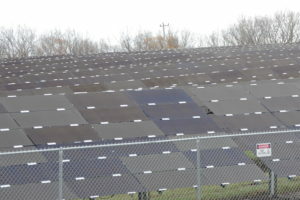 LIMA – Not all residents are happy with the Lima Town Board’s decision to restrict large scale solar fields in Lima. One Lima resident who attended the board’s July 6 meeting came with the request that certain exceptions be included in the law being drafted, particularly in scenarios where farmland is not being utilized for agriculture. According to Lima’s Town Attorney, Steve Kruk, however, the law will be worded to discourage variance. “We can never absolutely prohibit somebody from applying for a variance, but the way this will be drafted would be to greatly discourage the granting of any variance,” Kruk stated. Cathy Gardner, Lima Deputy Supervisor, re-iterated concerns about the lasting impacts to agriculture that large solar installations may have. Even with pending restrictions for large-scale commercial solar on the table, Gardner emphasized that private solar will be accommodated. Although the draft of the law was anticipated for the board’s July 6 meeting, Kruk plans to pass the document on to the town engineer as well as the board for comment and review prior to the board’s Aug. 3 meeting. At that time they will determine whether to proceed with the law as is or make changes. A public hearing will be held before the law is passed.